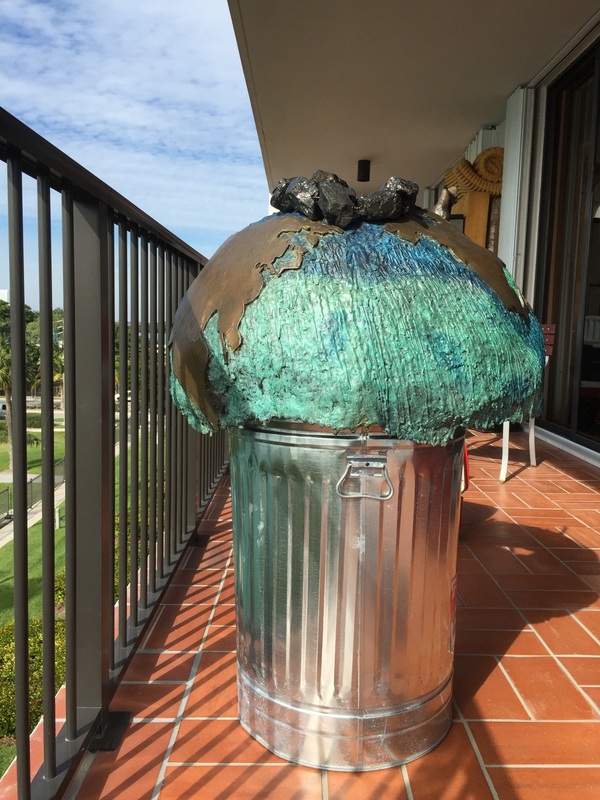 This globe with its melting oceans (actual melted wax drippings then cast in bronze), rests on a standard galvanized garbage can. The armature is almost completely hidden and cantilevers from the inside to a single point that the 180 pound bronze balances on from the inside. It is therefore gimballed in all directions, can also ring like a bell, or spin like a flywheel, echoing the flywheel effect in many of our ecological overreaches. There is a ring of actual anthracite coal around a gaping hole in the bronze where the Arctic Ocean should be. Anthracite coal is one of the worst things that we burn, and we burn lots of it in the United States, almost 50% of our electric is coal fired. I drilled the pieces and strung them on an antique brass chain and put them around the hole like Christ's crown of thorns. The anthracite coal glistens hauntingly and beautifully in the sunlight. 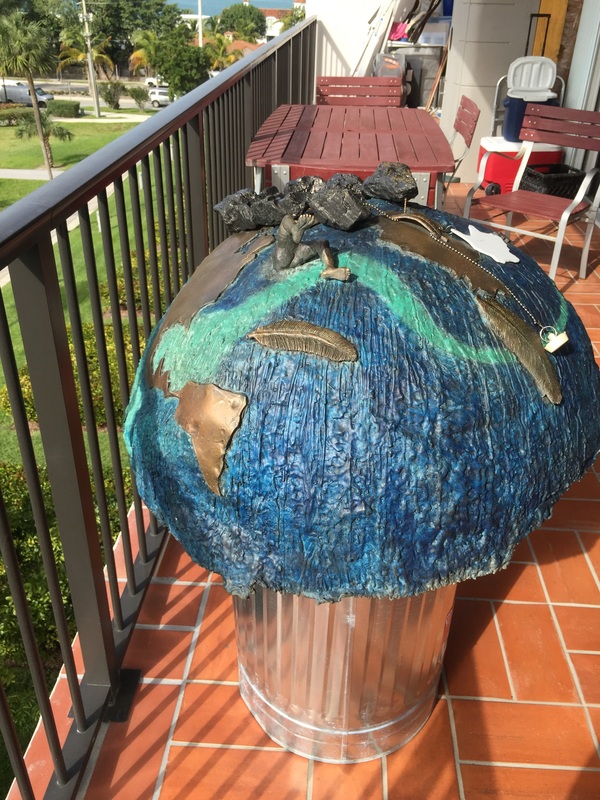 This sculpture was inspired by a Pieter Bruegul painting (c. 1558), "Landscape and the Fall of Icarus." Bruegul was depicting daily life on the hillside in the foreground and in the harbor below you could barely see a few miniscule feathers in front of one of the distant tall ships and only Icarus's tiny legs sticking out of the water as he drowns. The main theme of the painting is the curvature of the horizon as you look out of the harbor. Bruegul was speaking truth to power because the Catholic church was still insisting the earth was flat. I've placed Icarus's legs between the ice melt on Greenland and the mind-numbing fossil fuel lobbyists in North America. I hope to speak truth to power to my countrymen who still deny that climate change is something we need to respond to in an urgent way. 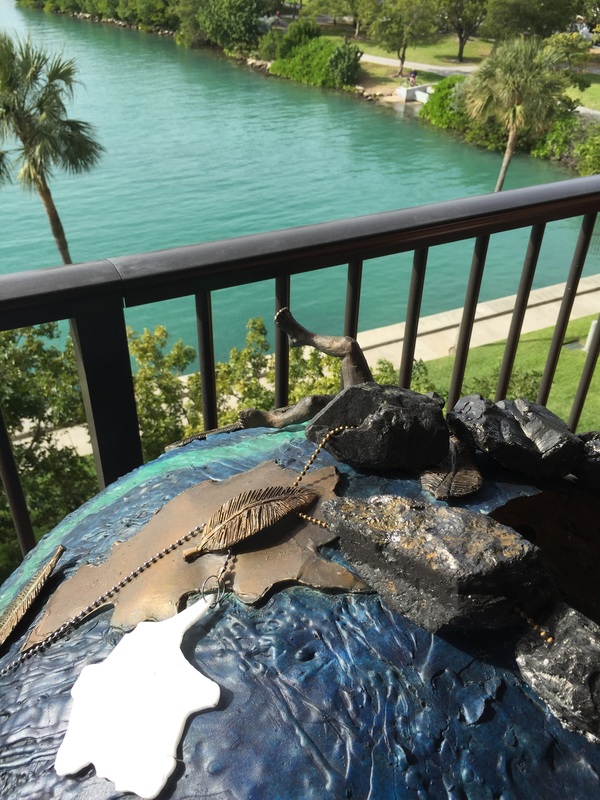 The contrasting patinas illustrate the vulnerable Gulf Stream, who some climate scientists believe may be shut down in the near future. The Arctic Ocean is cut out of white ABS plastic and is hung loosely on a silver drain chain with a rubber drain stopper at the other end. The Arctic and the plug are usually dangling down a gaping hole at the top of the globe, but for purposes of photography, they are laid out on the globe.